Trade Courses at One Price - Special Offer! MODULE 1: Introduction Video. Explanation of the Winning Trade System. The thinkorswim trading platform. Examples of personal trading profits. Strategy Overview. MODULE 2: Introduction to trading options. Basics of the strategies: Call options and Put options. How to limit your risk and preserve capital. MODULE 3: How options change in price. Affect of time and value. Historical basis. Intrinsic and extrinsic value. Looking at Delta. MODULE 4: Specific examples of how an underlying ETF effects the value of an option. Looking at Vega. About volatility. Buying an in-the-money call. Charts for QQQ. MODULE 5: Examples of buying at-the-money options. Setting a stop loss. At-the-money puts. Comparing options. MODULE 6: How to use technical analysis. "Predicting" the future of a market. Reading charts. Examples of Price Patterns. Using price action vs. other indicators. MODULE 7: Technical analysis part 2. Understanding the breadcrumb trail. Two important clues. Look at SPY. Low vs. high volatility environment. Daily vs. weekly charts. MODULE 8: More about reading low vs. high volatility. Looking at a great setup. Taking signals from charts to enter a position. 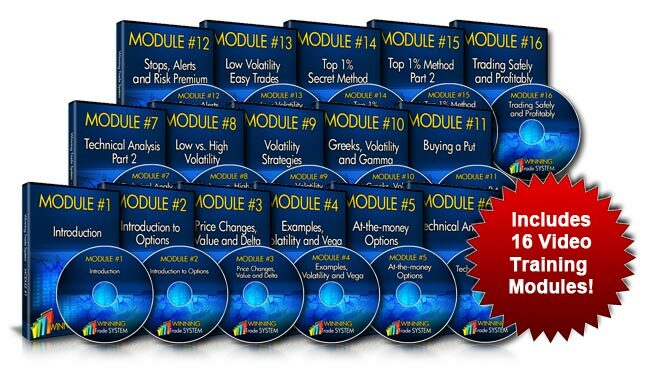 MODULE 9: Specific strategies for high and low volatility environments. Important information about trading frequently. Adjusting your trading strategy. MODULE 10: Reminder about the greeks. How price relates to volatility. High volatility trading strategy. Looking at Gamma. MODULE 11: Real life Winning Trade System strategies. Purchasing a put. MODULE 12: Setting stops or alerts. Analyzing a put option. Risk premium. What to do when a company is being bought by another company. Entering long position when volatility is high. MODULE 13: How to enter a long position when volatility is low. Making easy trades. When to enter and exit. MODULE 14: A little-known trading technique used by the top 1% of traders. Introduction to ratio trading*. MODULE 15: Important information about ratios. A closer look at ratio trading. MODULE 16: Ratio trading wrap up. How to trade safely and profitably. Winning Trade System summary and conclusion. Special Offer Ends Today, ! You'll get Instant Access to the Member Area...Even if it's 3am! If you aren't satisfied for ANY reason, simply let me know within 60 days and I'll refund 100% of your purchase. No questions asked! Back spreads and ratio spreads are simply the mirror image of each other. Back spreads and ratio spreads are comprised of either both calls or both puts at two different strike prices in the same expiration month. If the spread has more long contracts than short contracts, it is a Back Spread. If there are more short contracts, it is a Ratio Spread. Any ratio of long to short options is possible, but to keep it simple we will deal mainly with 1 by 2s in this article, i.e. long 1 option and short 2 option ratio spreads, and short 1 option and long 2 option back spreads. When naming this type of spread, the lower strike is generally stated first, whether it is long or short, so, it's the Sep 50/60 call back spread or ratio spread, and the 40/50 put back spread or ratio spread. Back spreads and ratio spreads can be executed for debits (you pay money) or credits (you receive money) or Even Money when there is no debit or credit. This occurs because the amount you pay for the long options in the spread is sometimes less than, equal to, or more than the amount you receive for the short options in the spread. This can be a bit confusing at times, because you might be a credit bid for a back spread or ratio spread. Call back spreads work best when the stock price makes a large move up; put back spreads work best when the stock price makes a large move down. Call ratio spreads work best when the stock price moves to the strike price of the short call (and no higher) at expiration; put ratio spreads work best when the stock price moves to the strike price of the short put (and no lower) at expiration. As you can imagine, the bigger the ratio of short options to long options in a ratio spread, the more risk involved. That's why most professional traders try to keep the ratio of short options to long options no greater than 1 by 2. Also, with the ratio at 1 by 2, the position is one long call or put away from a butterfly. This is a good way to reduce the risk of a ratio spread if the stock price starts going against you – in the heat of the moment it might be easier to buy the next higher call (for a call ratio spread) or lower put (for a put ratio spread) to form a limited-risk butterfly rather than trying to exit the ratio spread. You can then take a breather and trade out of the butterfly if you want, after that. Ratio spreads involve buying one option and selling a greater quantity of an option with a more OTM strike. The options are either both calls or both puts. The "ratio" of the spread is the number of short options divided by the number of long options. So, selling 3 XYZ Nov 60 calls and buying 1 XYZ Nov 50 call is a "1 by 3" ratio spread. It's useful to keep the ratio in terms of "1 by X", even if that "X" isn't a whole number. For example, selling 5 XYZ Nov 60 calls and buying 2 XYZ Nov 50 calls is a "1 by 2.5" ratio spread, although some traders will still refer to it as "2 by 5". But if you keep everything in terms of "1", you can tell much more quickly how many more short options the spread has. It's easier to see the "1 by 3" ratio spread has more short options than the "1 by 2.5" (as opposed to "2 by 5") ratio spread. The most common rationale for a ratio spread is to buy some options on a directional speculation and finance the purchase with the sale of options that are further out-of-the-money. Many investors seek to do a ratio spread for a credit, but to do so might mean in some instances that the ratio has to be quite steep (i.e., many more short options than long options). Since the options that the investor is selling are cheaper than the options he is buying, he has to sell more to recoup most of, all of, or even a greater amount than the purchase cost of the long option. That can lead to an extremely risky position. It is usually unwise to have a ratio spread with a ratio greater than 1 by 2. Never get comfortable or complacent with ratio spreads. Call ratio spreads lose money when the stock price rises sharply; put ratio spreads lose money when the stock price drops sharply. Monitor ratio spreads frequently and have a plan that can be enacted at a moment's notice to neutralize the risk. Be prepared for the worst. It is the spread that finishes careers. Back spreads involve selling one option and buying a greater quantity of an option with a more OTM strike. The options are either both calls or both puts. Like the ratio spread, the "ratio" of the back spread is the number of long options divided by the number of short options. The purpose of a back spread is to profit on a quick extended move toward, through and beyond the long strike. The purchase of a quantity of more long options is financed by the sale of fewer short options. The danger is that because the short options are closer to or in the money, they might grow faster than the long out-of-the-money options if the stock price moves more slowly or with less magnitude than expected. This happens even faster as expiration approaches. The long out-of-the-money options may lose value despite a favorable move in the stock price, and that same move in the stock price may increase the value of the short options. This is when the back spread loses value most quickly. This is depicted in the "valley" of the P&L graphs. The current day shows no valley, but over time one forms and gets deeper and deeper, signifying greater and greater losses. The price of the stock at the bottom of the valley, incidentally, is the strike price of the long options. If you can establish a back spread for a credit, the position can still be profitable if the stock price moves down (for a call back spread) or up (for a put back spread) enough to escape the "valley" of losses. Use as shallow a ratio as possible. Be sure that a large move in the underlying can be withstood without losing any money. This should be of greater concern than doing the spread for a credit. Stress-test the spread, assuming that a move will occur any moment. When trying to assess how a spread may perform, look at the spreads of deeper in-the-money options for an indication of relative prices. Should a what-if analysis reveal that traders will lose an uncomfortable amount of money, they should either flatten out their ratio, wait for another opportunity in the cycle, or look for a spread in another stock. This must be monitored often, always checking the prices of the relationships a few strikes deeper. The ratio should be adjusted as necessary, always testing for the chosen tolerance level. When steepening the ratio, consider doing it with a vertical instead of with naked options, so that in case of a devastating move, you will not be faced with exponentially increased exposure. Taking a closer look at several spreads gives the trader a sense of where the market believes that these ratios belong over time and movement in the underlying. The same exercise can be performed with butterflies to start building a mental database of price relationships. Volatility is not money. There is a different frame of reference for it every day and strikes have many different proximities to the underlying stock price. Spreads, on the other hand, are easier to keep track of; the frame of reference is all of the other spreads. This kind of analysis gives us a different perspective on price relationships and an insight into what the Back Spreaders and Ratio Spreaders do.